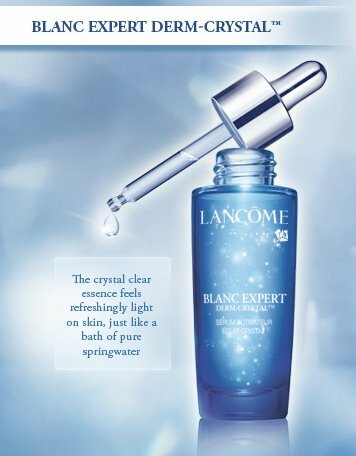 Visit any Lancome counter & ask for your 7-day Blanc Expert Customized Routine Trial. The new Derm-Crystal Essence targets the deepest skin layers to produce bright new collagen & contains a new generation Vitamin C that penetrates into your skin 10x more to reduce melanin production. Start today for porcelain skin that has a natural glow! Recently scientific discovery reveals that light in its purest form radiate from deep within the skin. This advance brightening complex technology is designed to stimulate the fibroblasts activity to awaken the dermis "luminosity". It favor the production of new bright collagen fibers and melanin production is regulated. Skin's natural light is created. It effectively reduce the colour of the sports, skin look fairer, skin tones looks more even and brighter.